Classic La Pavoni Europiccola lever espresso. My latest toy from Italy. In the process of replacing all seals / gaskets. Also full soak, clean and flushing of boiler from hard water etc. 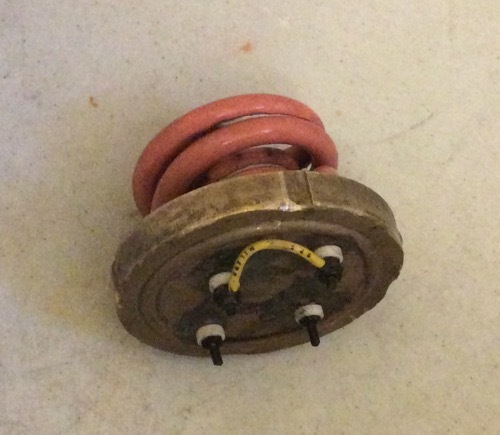 Plan on sending element for 120v conversion from it's current 220v. Issue that local charges here are more than double the cost (but quicker) than me sending it off to Hungry (6 weeks) for conversion. 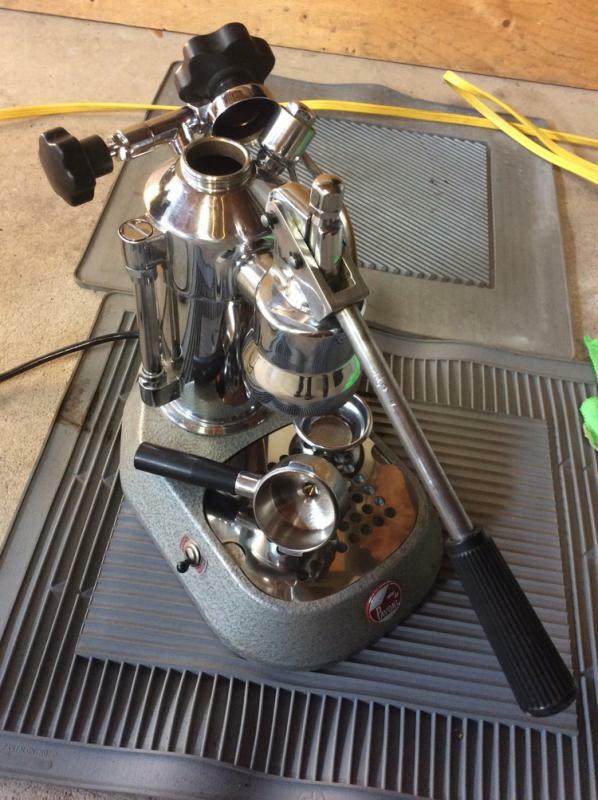 (10-09-2016, 06:10 AM)Red Rider Wrote: Classic La Pavoni Europiccola lever espresso. My latest toy from Italy. In the process of replacing all seals / gaskets. Also full soak, clean and flushing of boiler from hard water etc. Good luck and many happy years with the new machine. I'm only posting to say CONGRATULATIONS and I plan on following this thread closely. 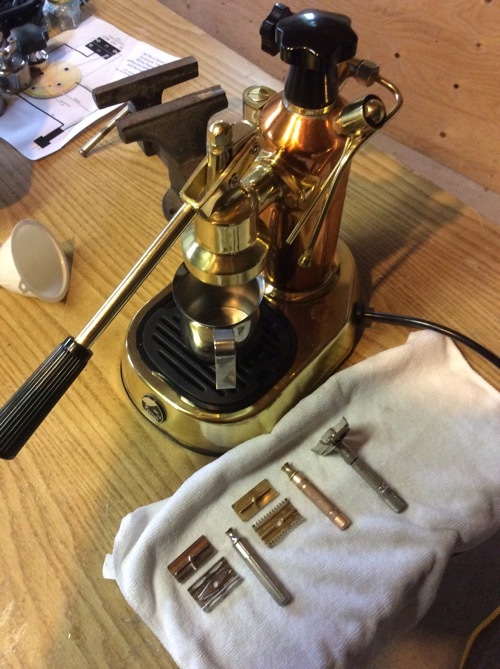 I've been making espresso at home for a few years now with a Gaggia Classic and a Ceado E37s grinder. I've also been roasting my own beans. The espresso rabbit hole is expensive and delicious. 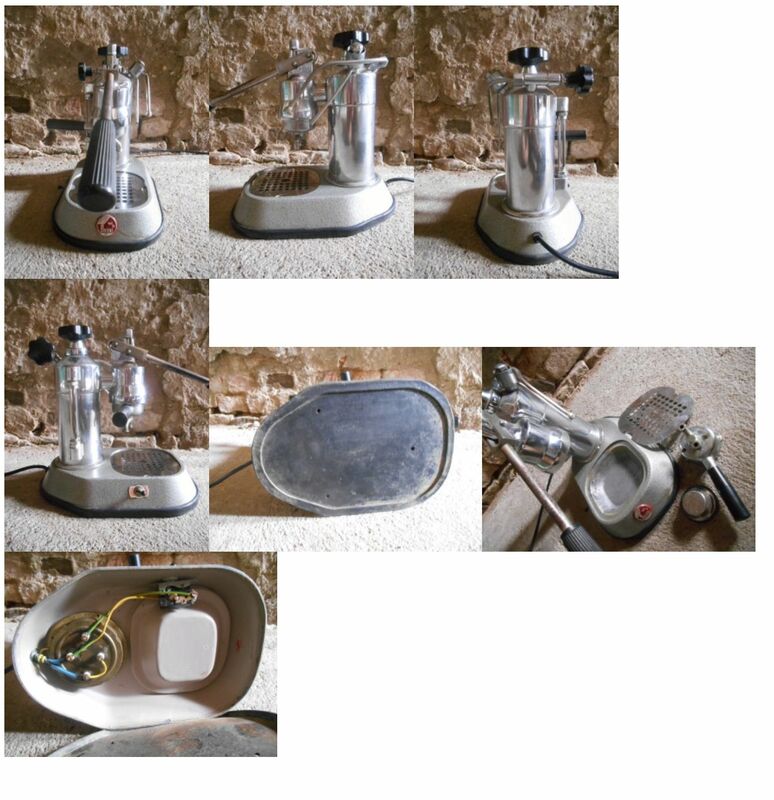 I recently sold a Zacconi Riviera Eagle and Arrarex Caravel lever espresso machine. I'm a fan of levers and still have a VAM & Caravel. They're open kettle and use a non-immersion element. I don't use steam as I'm a espresso drinker and make a Americano for my wife. (10-09-2016, 11:55 AM)Sully Wrote: I'm only posting to say CONGRATULATIONS and I plan on following this thread closely. Sully, have you experienced the "rooster tail" shooting from the E37S, that some on Home-barista have reported? It seems like a heck of a grinder for the money! I have a QuickMill Andreja, but a Baratza Vario as my grinder. I have not experienced the rooster tail effect at all. My first burr grinder was an entry level Baratza, after two years it died, I sent it back to Baratza to be repaired, it died about a year later and I upgraded to a Preciso. After about 2 years the Preciso stopped working. 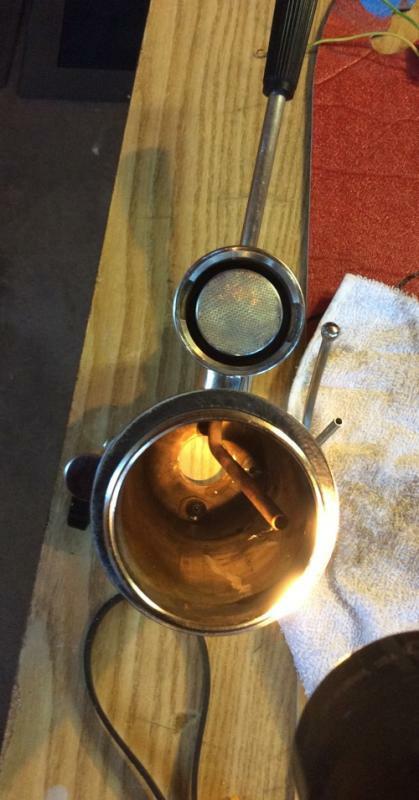 I sent it back to Baratza to be repaired and started saving my money for a professional grinder. I looked at the Vario as a replacement for the Preciso but the E37s was on sale and I'm a little leery of Baratza grinders and their life cycle at this point. The only issue I've had with the E37s is that very rarely when I push the button to start grinding the only thing that happens is the timer counts down but the motor doesn't turn on and it doesn't sound like the motor is even trying to engage. I've contacted customer service (at Whole Latte Love where I purchased the grinder) about it several times and they think something is jamming the burrs, I've never found anything that would cause a jam. I think the issue is that I'm grinding too fine and I'm just clogging the burrs. Overall I'm very happy with the E37s, it was a heck of an upgrade! Next I want to upgrade my Gaggia to something on the prosumer level or a lever machine. Very Nice Robert. Thanks for posting the pics! The Breville Double Boiler deserves a look see if upgrading from your Gaggia Classic. 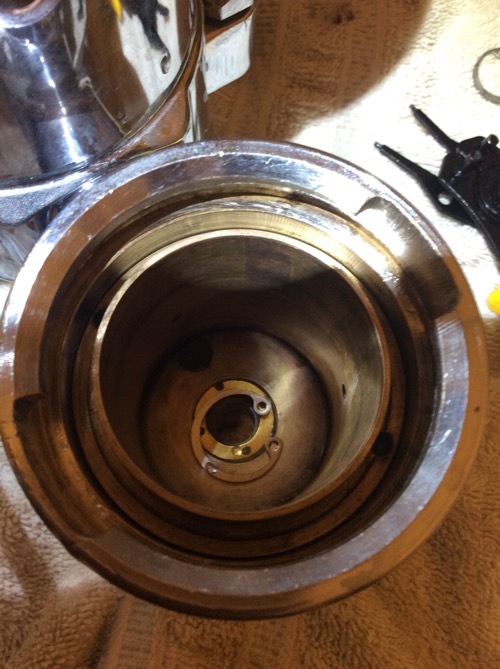 (10-16-2016, 04:20 AM)Pete123 Wrote: The Breville Double Boiler deserves a look see if upgrading from your Gaggia Classic. Absolutely, it's a machine that I've been looking at for a while. Thanks for the review! I still recommend Baratza as an entry level grinder but I had issues with the Preciso before switching the the Vario almost 5 years ago and it's been great. But when it dies I'm likely to go with a K30 or an E37S. Machine dissembled from base. Base sent to get powder coated. Waiting on seals/gaskets, Thermofuse and element. My first machine! My friends father gifted me an old one that was in perfect shape aside from needing to replace the head gasket. The machine that started it all for me and has led to an even larger and much more expensive obsession than shaving. Nice job with the teardown. Can't wait to see it all together again. Yep and folks think shaving is a rabbit hole. Went to a Canadian /U.S. border town to pick up a brass and copper La Pavoni espresso machine. While there I stopped off at a local antique store and picked up these 3 U.S. Gillette razors. Typically the Tech's and L.C. Gillette's I find are Canadian. Nice to find these to add to rotation. The F.B. needs some T.L.C. to get up to grade. Did not need the F.B. as I have a VG example but for the price and the fact that it was a all in package deal. 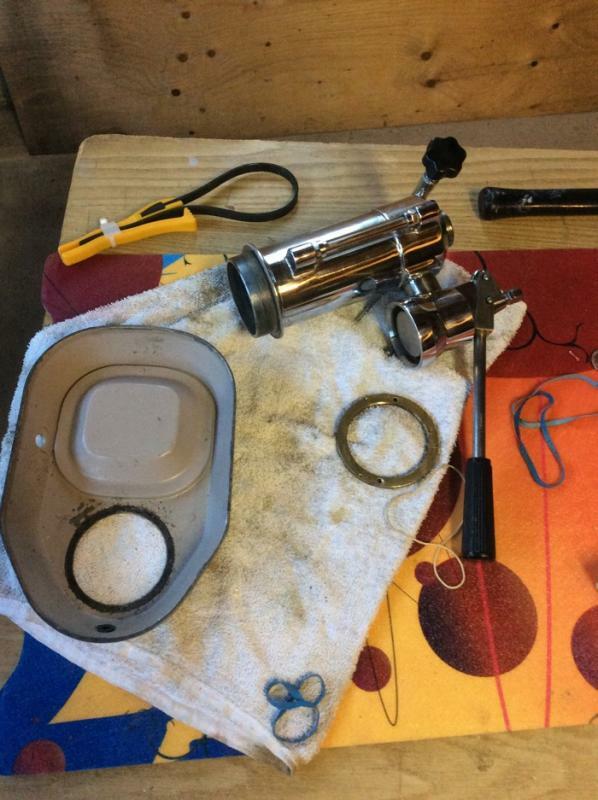 Here is a picture of the inside of the group head after replacing the inside seal and securing it with a new clamp. Received base after having it powder coated "safety yellow'. Wanted to punch it up. Like the yellow and black contrast.